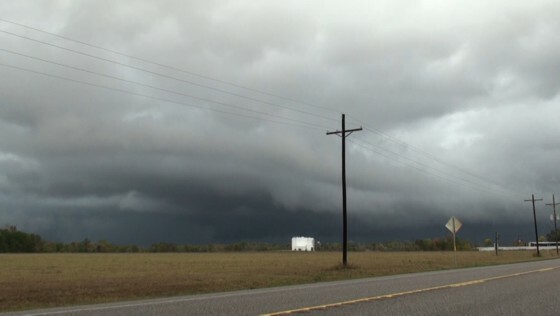 Wall cloud north of Dayton, TX. I was paying close attention to the weather yesterday (Tuesday, November 8), since I knew there was at least a chance for some supercellular-type thunderstorms across Southeast Texas. Having chased storms locally down here many times in the past, I certainly didn’t have very high expectations. 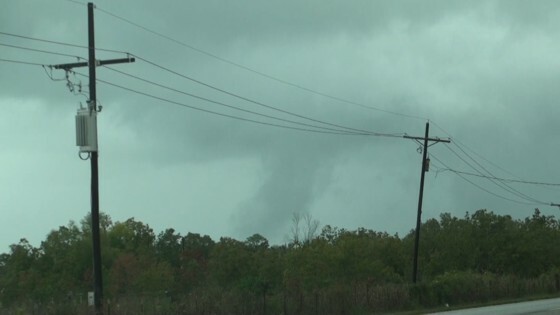 But, I knew if a storm could hold its own and remain isolated that the wind shear was strong enough to support a tornado. By noon the conditions were not exactly ideal with numerous scattered showers popping up well ahead of the dryline/cool front. I figured something would eventually fire and get its act together well west of Houston along or just ahead of the front, so I kept my attention focused there. Instead, an intense thunderstorm formed right over downtown Houston and slowly became better and better organized as it moved towards the northeast. With time, the storm began rotating. I abandoned my original ‘target’, told MaryLeigh we were leaving and headed out the door. Wall cloud with developing funnel north of Dayton, TX. Unfortunately, driving into downtown Houston on I-10 from Katy on a Monday afternoon isn’t exactly quick or easy (duh). And mother nature certainly wasn’t going to make it easy for us to catch this storm. Upon reaching the beltway, we saw a sign informing us of a major accident up ahead. We had to do some maneuvering, but were able to bypass the accident. This made it much more difficult to catch up to the storm. We reached the east side of Houston and shot northeast on highway 90. 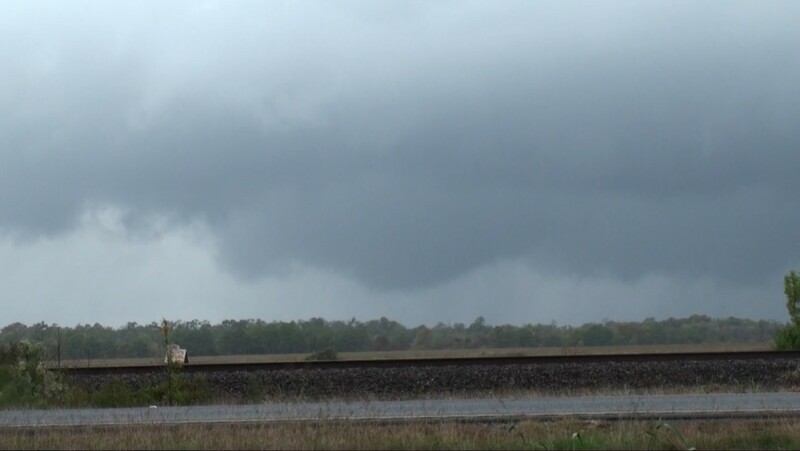 Brief tornado near Dayton, TX. By the time we’d driven a decent ways up highway 90, we approached the new storm that had fired just south of the original one. By this time storm structure was beginning to fall apart somewhat. But there was still some decent structure to be found. 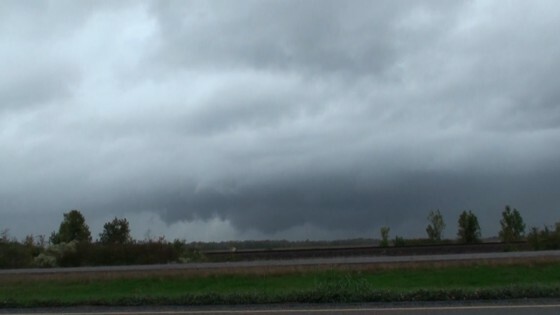 In fact, we drove through some heavy rain and saw a pretty well developed wall cloud just ahead. 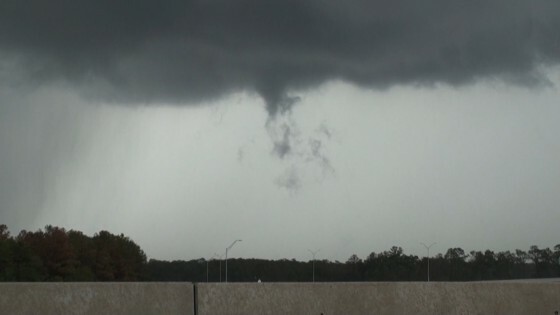 To our surprise, a very brief tornado touched down to our west! This is by far the weakest tornado and I’ve ever seen (and I realize I’m using the word tornado here rather loosely, but I did see a weak circulation on the ground). Mysterious funnel/scud bomb a few miles north of Liberty, TX. In the end it was a nice local chase. And considering we had to fight through Houston traffic and bypass an accident, I think this chase was pretty successful. For November, I’ll definitely take it.